The biggest news that Škoda has to present at the Geneva Motor Show this year is undoubtedly the new Superb. But that's not the most exciting. No, that would be the one you're looking at here. It's the latest in a long and proud history of the Škoda Octavia RS. Only this one is the most powerful yet. That may not be as much as the 280 we were expecting from the prototype we spotted testing last month, but with the power boost and an electronic differential, the Octavia RS 230 will run to 62 miles per hour in 6.7 seconds and top out at 155. That makes this "the fastest series-produced Octavia of all time," for those to whom such bragging rights are relevant. All we know is that it packs a stronger punch than the Jetta GLI we get here, and that makes us a little jealous. Mladá Boleslav, 20 February 2015 – At this year's Geneva Motor Show (5 to 15 March 2015), the third generation ŠKODA Superb will be celebrating its full public premiere – just two weeks after its debut in Prague. The brand's new flagship is the best ŠKODA of all time and features an emotive design, the most room of any vehicle in its segment, and innovative MQB technology. ŠKODA will also be celebrating the premiere of the sporty ŠKODA Fabia Monte Carlo and the racy ŠKODA Octavia vRS 230. ŠKODA is highlighting the brand's high dynamics through the strength of its appearance at this year's Geneva Motor Show. In 2014 ŠKODA achieved a new sales record; selling 1.04 million vehicles, the carmaker delivered more than 1 million ŠKODA vehicles to customers for the first time in a single calendar year. "The new Superb heralds the dawn of a new era for ŠKODA," said ŠKODA CEO Prof. Dr. h.c. Winfried Vahland. "Over recent years, ŠKODA has established itself as an international volume manufacturer. Our new flagship is now the highlight of ŠKODA's most comprehensive model campaign ever, and shows where ŠKODA stands today." He continued, "The car's outstanding design and engineering qualities, and the unbeatable space make our flagship the new benchmark in the automotive mid-class. The new ŠKODA Superb is a clear demonstration of our growth and points to the future of the brand." With its new, expressive design the new ŠKODA demonstrates the emotional power of the brand. The new Superb brings the exciting design of the 'ŠKODA VisionC' show car into series production. Its elegant yet dynamic appearance is supported by the use of the modular transverse matrix (MQB) from the Volkswagen Group. 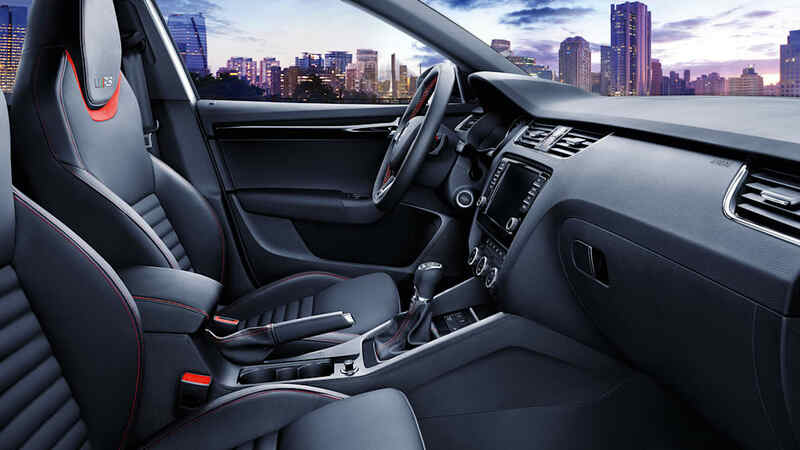 The new ŠKODA Superb sets standards in terms of room and comfort. The latest-generation Superb offers the best head and legroom in the rear and the largest luggage space in its segment. At the same time, the saloon is smarter than ever before, and offers 29 'Simply Clever' details. For the first time in a ŠKODA, the Superb features Dynamic Chassis Control (DCC), including drive profile selection. Alongside this there is a new air-conditioning system, including new three-zone climate control. An electronic sliding panoramic roof is also available, along with auxiliary heating, heated seats, wirelessly heated windscreen and an electrically operated boot that can also be opened with a 'virtual pedal' under the bumper. Thanks to the new parking assistant, the park distance control and the new rear camera, getting in and out of parking spaces has never been easier. And one other feature just in case: an umbrella tucked away in each of the front doors. The range of safety systems is more comprehensive than ever. These include standard multi-collision brake, as well as Front Assist, including City Emergency Braking, Automatic Distance Control, Proactive Occupant Protection, Lane Assist, Congestion Assistant, Blind Spot Warning, Reverse Parking Assistant, Emergency Assistant, Fatigue Detection, Speed Limiter, Traffic Sign Recognition, Hill Start Assist and an Electronic Tyre Pressure Monitoring system. The new Superb also features Smart Light Assist. The new infotainment system automatically connects to many smartphones, while details about the vehicle can be retrieved via SmartGate on your smartphone. Thanks to high-speed internet connection, the Superb is the first ŠKODA hotspot on wheels. With the ŠKODA Media Command app, you can operate the infotainment system from the rear using a tablet device. The new ŠKODA Superb boasts record values in consumption and emissions. Thanks to the new engines (five petrol and three TDI common-rail diesel), weight reduced by up to 75 kg, and better aerodynamics, the new model consumes up to 30 per cent less fuel, emitting less CO2 than previously. Despite the reduced consumption, the new engines actually provide up to 20 per cent more power on the road. Four-wheel drive is also available. The new ŠKODA Octavia vRS 230 will make its world premiere in Geneva. This automotive powerhouse features a racy design, sporty interior, modern technology and impressive power. The ŠKODA Octavia vRS 230 is the first ŠKODA to feature – as standard – an electronically controlled front axle differential lock for more dynamic cornering. The '230' designation relates to the new vRS special edition's horsepower, which helps the car accelerate from 0 to 62mph in just 6.7 seconds with its 169 kW or 230PS two-litre petrol engine. The car's top speed is 155 mph, making the ŠKODA Octavia vRS 230 the fastest series-produced Octavia of all time. The Octavia vRS special edition's European market launch is set for June. Also celebrating its world premiere in Geneva is the new ŠKODA Fabia Monte Carlo – in both saloon and estate versions. ŠKODA's new small car, launched just a few months ago, shows off its sporty side in the Monte Carlo edition. This attractive package brings a sporty interior and a wide range of features, making the new ŠKODA Fabia Monte Carlo one of the most exciting vehicles in its class. The key hallmarks of the ŠKODA Fabia Monte Carlo are black 16 or 17-inch alloy wheels, optional sports suspension, black design elements on the exterior, tinted rear and rear side windows and a tinted panoramic glass roof. The interior offers, among other things, a three-spoke sports leather steering wheel, black interior and sports seats with individual design.